Eleven drivers received nominations here, and again almost every major class was covered - all four ALMS classes and the Daytona Prototype class in Grand Am. Max Angelelli’s Grand Am championship winning form aboard the SunTrust Riley earned him a mention here. Jorg Bergmeister too gained the recognition of the panel, with storming form in the ALMS GT2 winning Petersen White Lightning Porsche. LMP2 winner Clint Field makes the list, the youngster maturing beautifully aboard the super quick Intersport Lola B05/40. Dyson Racing’s James Weaver, Butch Leitzinger and Andy Wallace are here too, Weaver for his commitment and searing pace, Leitzinger for his speed and racecraft and AWOL for not only his form aboard the Dyson Lola but also in the CITGO Howard-Boss Crawford in Grand Am. Champion Racing’s Emanuele Pirro joins the nine drivers lying in equal third place here. The ever smiling Italian again proved his worth aboard an Audi R8, with yet more silverware for the trophy cabinet. Second place by a whisker goes to the ‘other’ Ollie – Oliver Gavin again showing why it is that Corvette Racing went trawling for international talent. A dominant year from the C6.Rs was still never easy and in a hugely strong two car team it was driver talent that gave the edge to the #4 Corvette. Gavin was more often than not the star turn of the bunch and, with Ollie B, was GT1 Champion to boot. Winner here though was one of the veterans in the ALMS field, who campaigned aboard another ‘veteran’ – and won! Searingly fast, magnificent in traffic, a truly world class player in what is still the world’s most difficult sportscar championship to win. Our man took the fight to the rest and came out victorious. 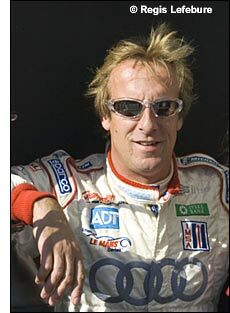 dailysportscar.com 2005 Driver of the Year for North America is Frank Biela.